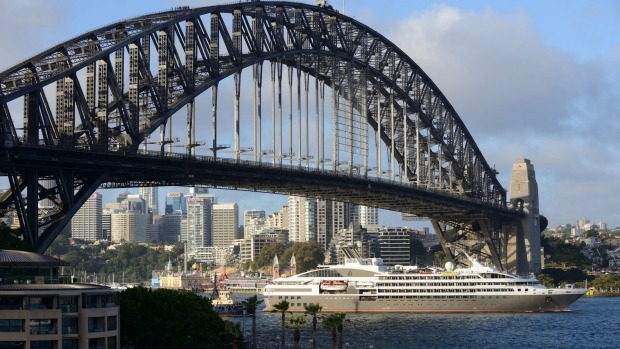 Ponant’s ship L’Austral in Sydney Harbour. Ponant’s latest luxury expedition ship Le Laperouse has a seven-night voyage from Sydney to Hobart this year that provides pole-position viewing as competitors in the Sydney to Hobart Yacht Race clear Sydney Harbour. Passengers will board the ship early on December 26 and be positioned off Sydney Heads as the maxi yachts battle for the honour of clearing the Heads first. The cruise then moves down the NSW coast, visiting Flinders Islands and Wineglass Bay in Tasmania before joining the racing yacht fleet at Constitution Dock in Hobart in time for presentations and New Year’s Eve fireworks. Small-group and self-guided tour expert InsideJapan Tours is offering cruise add-ons for passengers embarking or disembarking from a Japan or Asia cruise in the port of Yokohama. The add-ons include various experiences such as a bullet-train ride, hot-springs visit and elaborate kaiseki meal. The self-guided adventures range from a four-night “Oceans to Onsens” experience in Tokyo and Hakone to a 13-night “Port to Peaks” itinerary that heads inland towards the Japanese Alps, visiting castle city Matsumoto, alpine Takayama, the traditional cities of Kanazawa and Kyoto, and Hakone for a dip in its hot springs. Aurora Expeditions has launched the 2020-21 program for its new ship Greg Mortimer, which will sail to destinations including Antarctica and the Arctic, Iceland, West Greenland and Costa Rica. Among the cruises is a 16-day “Franz Josef Land Explorer” itinerary that crosses the Barents Strait and visits Russian Arctic National Park to see polar bears, whales, walrus, and seals. There’s also an 11-day “Iceland Circumnavigation” that explores remote fjords and bays in Westfjords before visiting Vatnajokull National Park, notable for glacial lagoons, black-sand beaches and Europe’s largest glacier. Book before March 31 for early-bird deals. Ecruising has a 23-night “Machu Picchu, Cuba, Panama and Colombia” journey that takes in seven Latin American countries and includes a 13-night cruise on Azamara Pursuit. The tour departs on March 15, 2020, with six days on land exploring Cusco and Machu Picchu before Azamara Pursuit sails from Callao (Lima) northwards through the Panama Canal and into the Caribbean, where it stops at Cartagena in Columbia, George Town in the Cayman Islands and Havana in Cuba before concluding in Miami. Guests spend two nights in Miami before returning to Australia.